Send Us Your Throwback Photos! The Republican-dominated FCC will vote next week on a nationwide One Touch, Make Ready (OTMR) policy that would allow new companies that want to add equipment to a utility pole to move existing equipment. A local OTMR ordinance in Louisville, Ky., has been disastrous, with dangerous mistakes made by contractors. Pole attachment work is complex, and if done incorrectly, can cause electrocution or poles to fall. CWA members in District 3 are leading the campaign to stop the policy from going nationwide. Over the past few months, they have gathered more than 9,000 signatures on a petition opposing this harmful policy and enlisted support from a bipartisan group of elected officials. CWA District 3 Vice President Richard Honeycutt and other CWAers hand-delivered the petition signatures today to the FCC in Washington, D.C. Honeycutt and CWA Local 3310 member Chad Melton also met with FCC commissioners to tell them directly how the policy would hurt workers. "I'm from Louisville, where OTMR is law, so I know how bad it is," said Melton. "The FCC wants to take away our work and our jobs. The proposal would allow contractors to do work that we have fought for and won in our CWA collective bargaining agreements." "OTMR risks public and worker safety," said Honeycutt. "And it gives our work – work with good, family-supporting wages and benefits – to unskilled, untrained low-wage contractors. 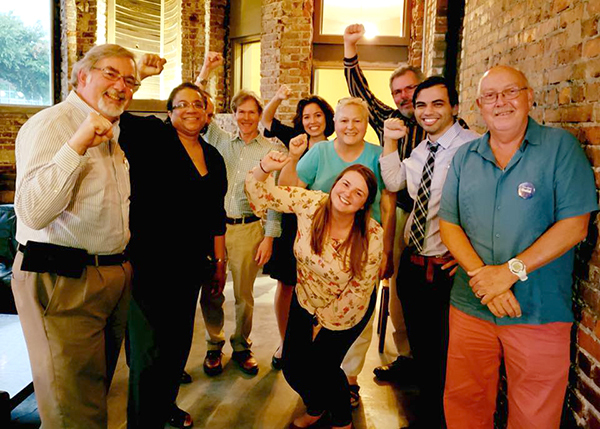 We've been actively fighting OTMR policies across the south and now we're making our voices heard at the FCC." Senator Bill Nelson and Representative Darren Soto, both of Florida, joined CWA members on a town hall call on Tuesday to discuss why they oppose the proposal. "We know that access to rural broadband is essential. But we know we have to do this right, and OTMR is a dangerous proposition," said Soto. "You can't have second-rate, untrained workers working with some of the most complex communications infrastructure in our nation. And we have to honor collective bargaining agreements." Nelson encouraged CWAers to submit comments to the FCC. More than 800 comments have already been submitted. CWA has set up a tool to make it easy to submit a comment. Click here to submit yours. 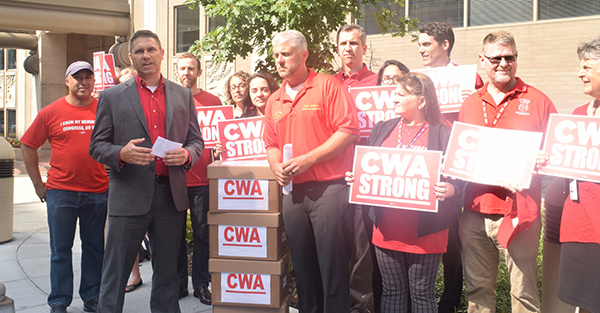 District 3 Vice President Richard Honeycutt, CWA Local 3310 member Chad Melton, and other CWAers hand delivered petition signatures opposing the harmful OTMR policy to the FCC in Washington, D.C. This week, Ohio State Senate minority leader Kenny Yuko, along with all of the Democratic members of the Ohio State Senate, sent a letter to AT&T Ohio President Adam Grzybicki calling on the company to bargain a fair contract with CWA members at AT&T Midwest and AT&T Legacy T that addresses job security and the return of offshored and outsourced work. Before the tax bill passed, AT&T CEO Randall Stephenson pledged at least $1 billion in tax savings to create "7,000 good jobs for the middle class." Instead, ongoing layoffs have compounded workers' concerns about the company's practice of shifting work to low-wage overseas contractors. "We stand with the workers of Ohio and we support the CWA's bargaining position for job security, healthcare, and the return of contracted outsourced and offshored jobs," the Senators wrote. Read the full letter here. CWA also launched a first wave of radio ads to raise awareness of AT&T's broken promise to use a portion of its $20 billion tax break to create jobs and to ask members of Congress who voted for AT&T's $20 billon tax break to hold the company accountable. Listen to the ads here. An overwhelming majority of union members at Consolidated Communications in Northern New England have authorized leaders to call a strike if negotiations do not lead to an acceptable outcome. CWA Local 1400 and IBEW System Council T-9 together represent more than 1,000 workers in Maine, New Hampshire, and Vermont at the company. Negotiations began in April on a contract that expires August 4. "The goal is to reach a fair agreement and avoid a strike, but our members are unified and ready to stand together for a fair deal, no matter how long it takes," said Don Trementozzi, President of CWA Local 1400 and co-chair of the bargaining team. "Just three and a half years ago, our members walked the picket lines for 131 days in a historic strike that garnered massive support from our communities. If we have to, we're ready to do it again." Supreme Court nominee Brett Kavanaugh has routinely ruled against CWA members and working families. Kavanaugh's views are extreme, and his unwillingness to protect workers even extends to life-and-death situations. In a case involving the death of a Sea World trainer who was working with a killer whale, he dissented from the majority, holding that the Department of Labor lacks authority to regulate activities of participants in sports events or entertainment shows in order to protect their health and safety. We can't afford to have another Supreme Court justice who thinks that corporations should have more rights than working people. Make a call to your Senator now and tell them to commit to protecting the rights of working people by opposing Brett Kavanaugh's nomination to the Supreme Court: 1-888-894-6720. 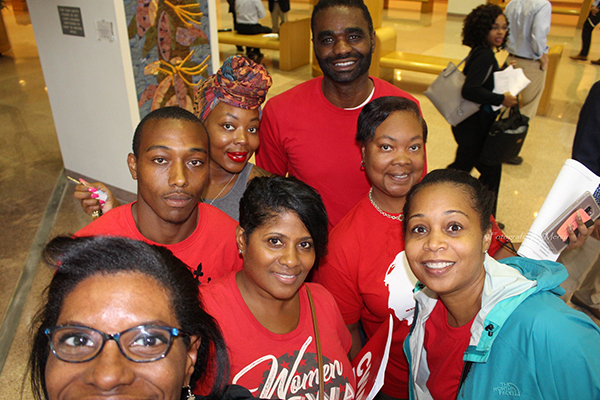 A group of CWA activists attended the Charlotte City Council meeting last week to raise concerns about working conditions at the city-owned airport. CWA Local 3645 Vice President Donielle Prophete, one of CWA's Political Boot Camp graduates who works as a passenger service agent for Piedmont Airlines, spoke at the citizens' forum, which drew attention from the local media. Prophete shared her personal experience with passenger assault, a serious, prevalent issue for passenger service agents. The passenger who assaulted her was able to simply get on their next flight because adequate passenger service agent protections have not been put in place. "The passenger cut my finger. My finger swelled," Prophete said. "I ended up contracting MRSA and was out of work for 22 days." Charlotte Councilman Braxton Winston said he would work with CWA members to make sure all their concerns are addressed. Bank workers from the Committee for Better Banks, a CWA project, escalated their fight for better working conditions last week, meeting with staff from key Senate offices in Washington, D.C., testifying at a congressional briefing, and meeting with the Consumer Financial Protection Bureau. To cap off the busy week, the workers spoke on a panel at a conference at the Solidarity Center put on by the Kalmanovitz Initiative for Labor and the Working Poor and the Friedrich Ebert Stiftung Foundation. The congressional briefing, hosted by the Congressional Progressive Caucus, shone a spotlight on a new report revealing that frontline bank workers at the country's biggest banks still face high-pressure quotas, low pay, and few opportunities to advocate for better customers. Lariese Reeves, who works at Santander Consumer USA, said at the briefing that the company has a constantly changing metrics system to determine workers' pay. "People work to feed and care for themselves and their family, so changing the metrics midstream could be a life-changing decision on whether I can repair the car I need for transportation after paying rent," Reeves said. "This adds stress for workers and can affect interactions with consumers. We just want the time and ability to help our customers thoroughly." Peggy Spencer, who works in customer service at Santander Consumer USA, spoke about the workers' demand for Santander to allow employees to form a union without interference. "We do not have a voice on the job. When we try to speak up, our voices cannot reach the executives that need to hear what we have to say. Banco Santander workers are represented by unions in Argentina, Brazil, Chile, Germany, Italy, Mexico, Poland, Portugal, Spain, and the United Kingdom. A union would help make the bank better, it would improve customer service, and it would make our jobs better. We could be more productive, which is better for the bank." The importance of strengthening protections for bank workers and supporting their efforts to join together in unions was also highlighted by Nobel laureate Joseph Stiglitz during an event in New York City held to coincide with the United Nations' annual High-level Political Forum. 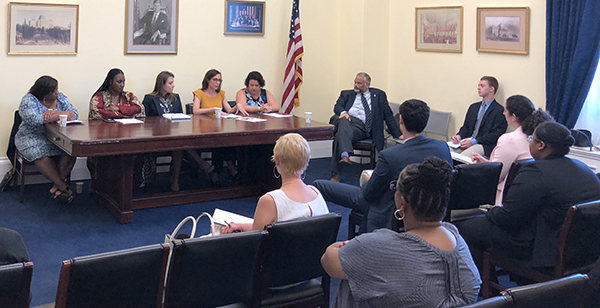 Bank workers from the Committee for Better Banks, a CWA project, spoke about their working conditions at a briefing hosted by the Congressional Progressive Caucus. 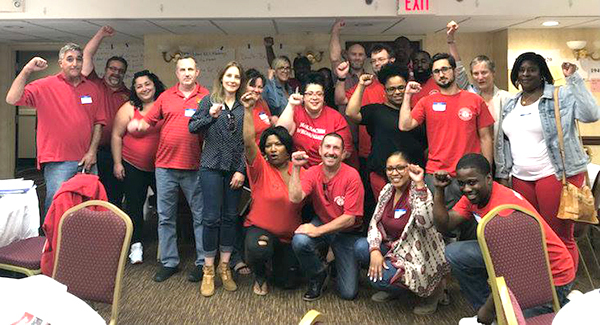 CWA Local 1298 members in Connecticut gathered for a CWA Runaway Inequality training last week. Workshop attendees spent the day digging into the roots of income inequality in the U.S. and how to fight it. Attendees then put their newfound skills to work by calling their legislators to talk about important issues, including demanding an end to tax breaks for companies that ship jobs overseas. CWAers stood in solidarity with AFGE members at a rallies in Washington, D.C. and across the country, as the union representing federal government employees gears up to fight President Trump's illegal union-busting executive orders in court this week. On May 25, the Trump administration announced three executive orders that attack workers' rights and representation for federal employees. AFGE filed a lawsuit in the U.S. District Court for the District of Columbia along with several other unions to challenge the orders. CWAers stood in solidarity with AFGE members at a rally in Washington, D.C.
Do you have old photos of you and your co-workers on the picket line, pictures of your family sporting CWA red, or videos of CWA mobilizations? If you follow us on our Facebook, Twitter, or Instagram accounts (@CWAUnion), then you've seen some of our Throwback Thursday posts. We'd love to feature even more CWAers! Please send your photos or videos with a short explanation including approximately when, where, and why to news@cwa-union.org or send a direct message to any of our @CWAUnion social media pages.